This wonderfully spotted purple Masdevallia species is endemic to Bolivia where it grows in mossy cloud forrest between 2400-2800m altitude and so our plants enjoy cool damp conditions in Cool Americas where it flourishes in a small basket. 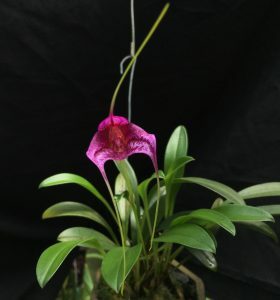 Masdevallia is a lovely genus to grow giving varied flowers throughout the year on mostly small growing plants. If you can provide the cool, shaded and damp conditions that most of the genus enjoy plants bulk up and propagate easily by division. Sounds like these lovely little orchids would grow well in a bathroom. Is this right?